We are…God knows, a people who walk in darkness. There seems little need to explain. If darkness is meant to suggest a world where nobody can see very well — either themselves, or each other, or where they are heading, or even where they are standing at the moment; if darkness is meant to convey a sense of uncertainty, of being lost, of being afraid; if darkness suggests conflict, conflict between races, between nations, between individuals all pretty much out for themselves when you come right down to it; then we live in a world that knows much about darkness. Darkness is what our newspapers are about. Darkness is what most of our best contemporary literature is about. Darkness fills the skies over our own cities no less than over the cities of our enemies. And in our single lives, we know much about darkness too. If we are people who pray, darkness is apt to be a lot of what our prayers are about. If we are people who do not pray, it is apt to be darkness in one form or another that has stopped our mouths. This description of darkness sounds all too familiar to me. I have an impulse to turn away from it, to not dwell on it lest it engulf me (as it has so many times). I have a reluctance to admit how easily it can engulf me and for how long. To be honest, I fear the depression it can bring on and how helpless I can feel in the throes of it. I don’t want to risk feeling that dark, that hopeless, again. Light doesn’t turn away from darkness. It pierces it and exposes everything in it. It looks into every corner to find what might be lost, to nourish what might be starving, to bring order where there is disorder, to give sight where there is blindness. The darkness does not taint it, does not overcome it. 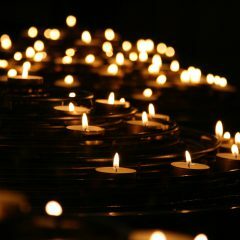 Light feels anguish at what it finds in the dark; anguish that breaks the heart and sweats blood. Anguish is Love encountering the beloved in darkness; Light suffers anguish because the beloved is worth it. Light, because of its anguish, brings warmth and hope and joy to the one engulfed in darkness. God in me, with me, is that Light. God in us, with us – Immanuel! – is that Light, doing even greater things through us, the many, who are following Him, the One. The land once covered in darkness has seen a great light. The land now covered in darkness can see a great light – if I, if we, follow the One in not turning away from it. And if he is the truth and the life, we will find it out soon enough for ourselves, you can be sure of that. If we want to find it out, if we are willing to draw near in whatever idiotic way we can, all our reservations and doubts notwithstanding, because little by little we find out then that to be where he is, to go where he goes, to see through eyes and work with hands like his is to feel like ourselves at last, is to become fully ourselves at last and fully each other’s at last, and to become finally more even than that: to become fully his at last. We draw near to him by following him even on clumsy and reluctant feet and without knowing more than two cents’ worth at first about what is involved in following him — into the seventy-five-mile-an-hour, neon-lit pain of our world. I think…there is…hope that, if not tomorrow or the next day, then some fine day, somehow, life will finally give us the present that, when we open it, will turn out to be the one we have waited for so long, the one that will fill the empty place, which is the peace that passeth all understanding, which is the truth, salvation, whatever we want to call it. But one by one, as we open the presents, no matter how rich and wondrous they are, we discover that not one of them by itself, nor even all of them taken together, is the one of our deepest desiring — that ultimately, although her face is beautiful and draws us to her, life by herself does not have that final present to give.